This quartet has been performing since 2003, mostly in New York at the Village Vanguard, the Jazz Standard, Fat Cat, Dizzy’s, and Birdland. The first week it was billed as “The Ethan Iverson/Mark Turner quartet.” But after Billy asked it to be his band for a night for a gig in New Jersey, the other members unanimously voted to give it him permanently. There has never been any doubt that the right name was on the bill: At every gig, fans and musicians from all over the world come out to support a drummer who has engendered so much love and respect during so many years of touring, teaching, and living. 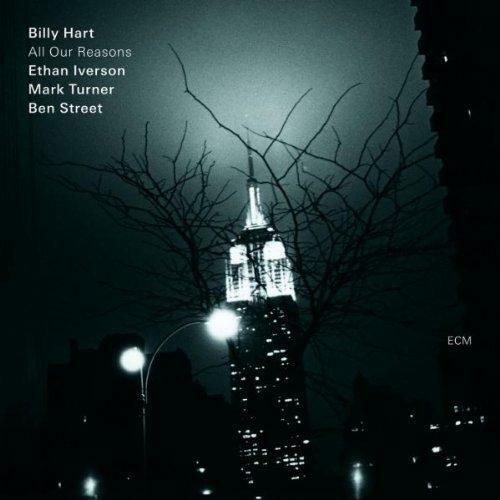 Ethan Iverson interviews Billy Hart in 2006 and 2008. There are two records for ECM and one for High Note. Lennie Groove (Turner) Mark Turner’s melding of Tristano and clave was recorded years ago on the early Turner album In This World. Since then, it has become a classic, with many musicians trying their hand at its stunning complexities: odd meter, unusual bass line, fast doubled melody. My intro suggests Tristano sped up and spun out. Maraschino (Iverson) The blues may come in any and all colors. Perhaps a wisp of Paul Bley is here, along with collective free improvisation that strives for structural integrity. Billy Hart’s brushwork is masterful, so swinging yet without any clear pulse. Teule’s Redemption (Hart) This was written for one of Billy Hart’s sons, a two-part work that eventually allows Ben Street and Hart to work closely on a powerful groove. Turner’s solo takes flight. Amethyst (Hart) This unusual through-composed piece is another gateway to free improvisation. At one moment Hart and I are left to ourselves, allowing cubist patterns to repeat and develop. Yard (Hart) He was there, right on the scene, when jazz began embracing the even-eighth note as a legitimate resource. This blues connects Charlie Parker with all those grooves Hart played with Jimmy Smith, Herbie Hancock, Miles Davis, and so many others. The fierce abstraction achieved by every member of the group attests to a long working relationship. Some Enchanted Evening (Rodgers/Hammerstein) This group doesn’t play many standards, but in this case Hart (who loves musicals) wanted something for almost for encore purposes, a gentle reframing of the familiar. Big Trees (Iverson) Specifically written as a drum feature. The idea of “rhythm changes” lurks in the background but is quickly discarded by the ensemble. 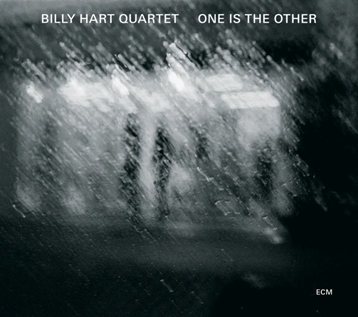 The drumming may momentarily suggest other masters like Ed Blackwell or Max Roach but in the end Billy Hart sounds like nobody but himself. NPR review by Kevin Whitehead. Guardian review by John Fordham. Jazzblog.ca review by Peter Hum. AAJ review by John Kelman. Something Else review by S. Victor Aaron. AllMusic review by Thom Jurek. 2014 interview of Billy by R. J. Deluke. All Our Reasons (ECM) was recorded June 2011 and released March 2012. NY Times review by Nate Chinen. Time Out NY article on Hart and Iverson’s relationship by Hank Shteamer. Boston Globe interview of Hart and Iverson by Andrew Gilbert. eMusic review by Peter Margasak. Boston Phoenix interview by Jon Garelick. All About Jazz review by John Kelman. Lexington and Beyond review by Walter Tunis. About.com review by Jacob Teichroew. LondonJazz review by Chris Parker. Irish Times review by Cormac Larkin. Los Angeles Times review by Chris Barton. Jazz Session podcast with Jason Crane. BHQ live reviews: Will Friedwald, Ben Ratliff, Steve Smith. 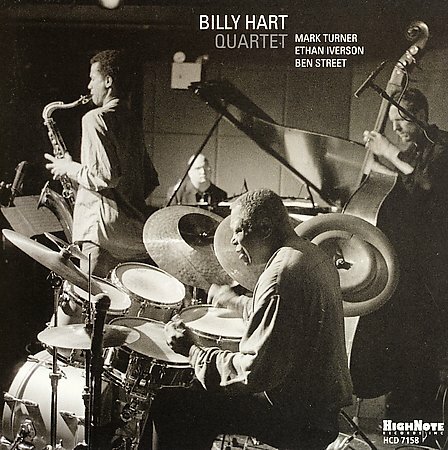 I’m devoted to Billy Hart, but I’m also devoted to Mark Turner and Ben Street. On September 23, 2009 the group played a set at the Vanguard that was documented by NPR. 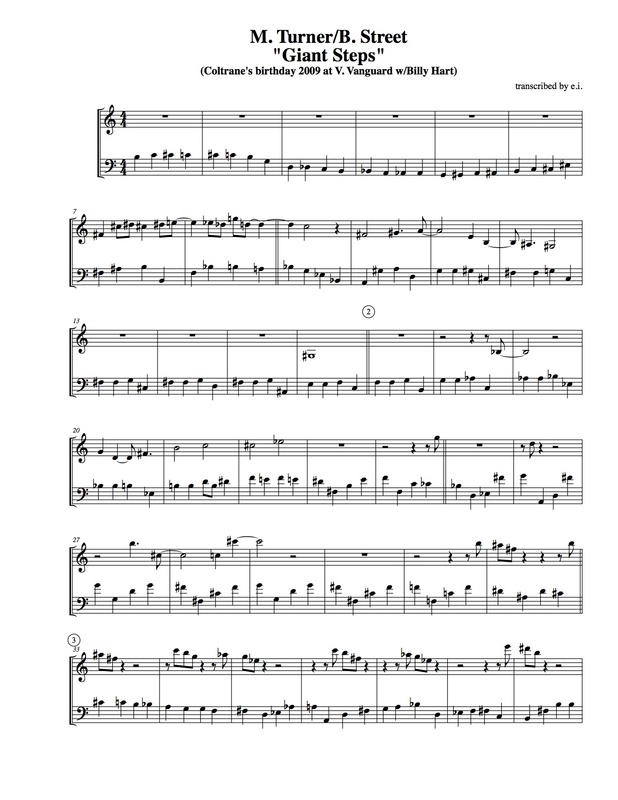 I was so impressed by the way Mark and Ben played “Giant Steps” that night that I transcribed it. The group’s first release, Quartet (High Note), recorded October 2005, was chosen as one of the “10 best jazz records of 2006” by K. Leander Williams at Time Out NY and Nate Chinen at the New York Times.